BRAND NEW PROPERTY - Escape to our home in Paradise…Lighthouse Unit 3A. This property is ideal for those looking for privacy and relaxation and at the same time have access to all the amenities that a resort has to offer! The Lighthouse at Oyster Bay, located at the tip of a distinctive hideaway, offers a unique vacation experience in a private residence. Characterized by its iconic rooftop rotunda, The Lighthouse boasts a total of 18 spectacular 3 Bedroom residences. 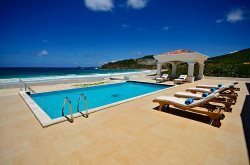 The rooftop “vanishing edge” pool and 360-degree glass dome clubhouse offer panoramic views of St. Barths, just across the Atlantic Ocean, as well as the picturesque Oyster Pond Marina. Upon arrival, guests are greeted with a Grand Stair and tropical glass mosaic fountain. Inside, the double master suite-designed residences, feature inspired architectural detailing, and have been crafted with the finest materials. Lighthouse Unit 3A is a luxury condominium located on the third floor of The Lighthouse complex. Nestled between the island’s mile long Dawn Beach and Oyster Pond, you can enjoy the beautiful views of the ocean and take in the refreshing breezes. Oyster Bay Beach Resort is just steps away from The Lighthouse and extends access to Oyster Bay Beach Resort facilities and its full menu of activities to Lighthouse residents and guests. In addition, there are five wonderful restaurants to include Italian cuisine, beach bar, fresh seafood and luncheon cabana. The Lighthouse is located just 10 minutes away from Orient Beach and 15 minutes away from the village of Grande Case, the dining capital of the Caribbean. • The state-of-the-art kitchen features a breakfast bar/island with seating for 3 persons and island sink; top-of-the-line appliances from the GE Monogram series to include cook top, oven, refrigerator with ice maker, microwave – Kitchen accessories include coffee maker, toaster, blender and garbage disposal. • Two Master Suites, Each with a king bed offer premium bedding and linens, flat screen TV, IPod ready clock radio and views of the ocean from the private balcony. Fully appointed in-suite, five fixture master baths. Granite-finished showers with frameless glass enclosures, double bowl sinks and two-person soaking tub. • Third guest room has two twin beds offering premium bedding and linens, flat screen TV with digital cable service, iPod Dock and direct views of the ocean from the private balcony. The en-suite bathroom offers a private shower, single bowl sink & water closet.